Where else can you bowhunt up to 10 big game species at a time and realistically expect to shoot half a dozen animals or more on a 10-day bowhunt? 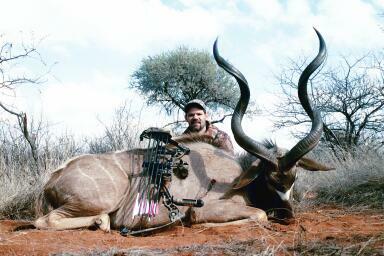 The answer is Africa and many adventurous bowhunters are beginning to realize the treasures that await them there. I personally can’t get enough of African bowhunting and just returned from a wonderful 10-day bowhunt in South Africa where I was fortunate enough to harvest 9 mature animals. 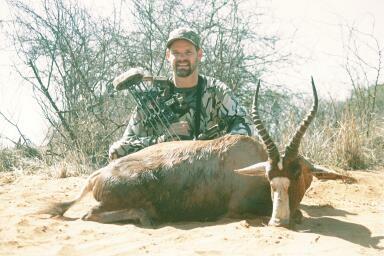 This was my third trip to Africa but my first bowhunt to South Africa. 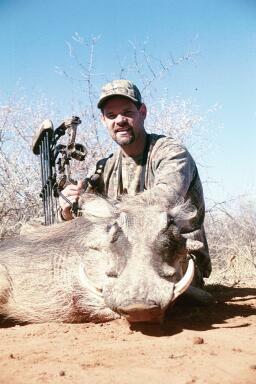 I had previously bowhunted Zimbabwe and Namibia in 1999 and 2002. I enjoy hunting different countries and hunting concessions each time I go to Africa get a different flavor for the varying terrain and wildlife. I booked my hunt through Dave Holt’s Africa. Dave, in addition to being the Technical Editor for Bowhunter Magazine, is arguably one of the more knowledgeable bowhunters on bowhunting Africa. 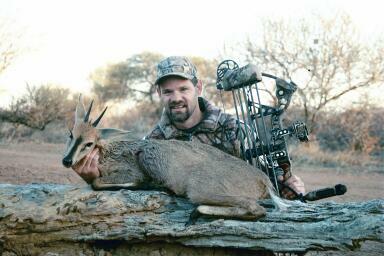 Dave spends nearly 4 months in Africa each summer (their winter) overseeing bowhunts and evaluating new properties. 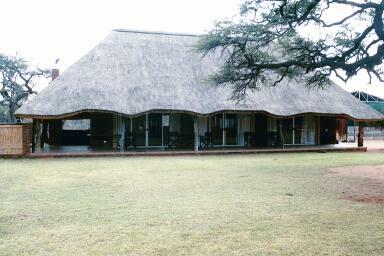 He has several different hunting concessions in South Africa and Namibia to choose from and all of his concessions are bowhunting only. Being an experienced bowhunter Dave goes to painstaking efforts to make the hunts as bowhunter friendly as possible. For example, he uses large, quiet bowhunter-friendly ground blinds and elevated box blinds. He also uses various techniques to promote close-range, effective bowshots such as stacking thorn brush on the far side of the waterholes so animals drink broadside directly in front of the blind. This leads to clean, quick bow kills and happy hunters. Nothing is more frustrating than having a trophy animal drink on the far side of the waterhole only offering a fleeting, long-distance, poor angle shot opportunity. I hunted two side-by-side private hunting concessions in the Northern Province of South Africa. The location was about a 4-1/2 drive north of Johannesburg near the Limpopo River. The two hunting concessions comprised a combined 25,000 acres of private land. Both concessions are managed as bowhunting only. These concessions have an incredible variety of species to bowhunt (the most I’ve seen anywhere) including zebra (Burchell’s), kudu, waterbuck, eland, gemsbok, hartebeest, wildebeest, blesbok, impala, warthog, duiker, steenbok, baboon, and jackal. And the trophy quality of the animals I saw was subperb. The accommodations were also excellent and consisted of a permanent dining chalet and permanent sleeping quarters. I sat the Hartebeest blind on the north ranch (Frost). The blind was a large, elevated box blind with a thatched roof. 8:30 A.M.: Two warthog sows came in and drank at the waterhole. A Blacksmith Plover waded in the water. 9:36 A.M.: A sow and piglet warthog came in, drank and fed on a specially-blended feed mixture that consisted of grain, molasses, and minerals. 10:00 A.M.: A duiker ram drank on the right side of the waterhole at the edge of the stacked thorn brush. I turned on my camcorder but just before I was ready to shoot, three warthogs ran in and spooked him. 11:36 A.M.: A steenbok ewe and ram fed about 100 yards east of the waterhole. The ram had exceptional horns for a steenbok, which were much taller than his ears. 12:00 Noon: A young gemsbok cow came in and drank. Then a nice waterbuck bull drank on the right side of the waterhole about 20 yards away. Unfortunately while he was drinking, he always had his left leg back and I didn’t take the shot. 1:00 P.M.: Half a dozen eland, including one bull, fed about 100 yards on the other side of the waterhole. They looked like they were going to come in and drink but decided not to. 2:00 P.M.: Seven cow and calf kudu came in and watered directly in front of the blind at about 10 yards away. 3:00 P.M.: Three big mature impala rams came in and drank, licked the salt block, and fed on the feed. After watching and filming them for a while, I noted that one of the rams was exceptional and decided to take him if he offered a shot. Finally, he gave me a nice quartering away shot at 23 yards. I arrow hit right behind the shoulder and he only ran about 80-100 yards. 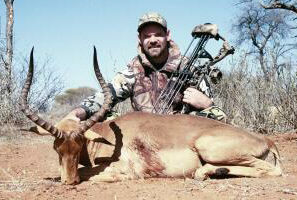 He had 25-inch long horns, which is an exceptional impala ram. 6:00 P.M.: A huge waterbuck bull warily circled the blind at last light and then came in and drank but was slightly front quartering. So I patiently waited. He drank for a long time and then started to leave. He made the mistake of pausing at the edge of the waterhole at about 20 yards from the blind. At first look, the shot looked a bit high. But when I played back the video, the angle from my elevated blind looked good. My worries were alleviated when the PH, Christo, arrived and made quick work of the tracking. The bull was huge! We measured his horn length at 29 inches and the horns were very massive. My PH said the bull was somewhat equivalent to a Boone & Crockett class animal. How exciting! Two tremendous trophies on my first day of bowhunting – it doesn’t get much better than that. Surprisingly, it would. I sat the “Buffalo Stand” on the Frost Ranch. In front of the blind was a small, manmade waterhole about 10 feet in diameter. Beyond the waterhole were thick tall trees. The day was generally uneventful from a bowhunting perspective but I did see several kudu cows and calves, two nyala ewes, and several warthogs. Then just before dark, I heard some animals behind me and heard a clicking noise. One of my friends on the hunt, Ken Asbury, had mentioned that eland make clicking sounds when they walk as their hooves hit against each other. But the noise was behind the blind where I couldn’t see out. Eventually the noise moved around to the left side of the blind where I could look out a small viewing window. Sure enough, when I peaked out the window, I saw a herd of eland standing at the edge of the trees about 60 yards away. My heart jumped into my throat as I saw these animals. Eland are huge animals, up to 2,000 pounds, and they were on my list of desired animals. But they just stood at the edge of the trees until dark when my PH drove up in the vehicle. Today I sat the “Impala Blind” on the south ranch (Pete’s). The blind was an elevated box blind overlooking a small, concrete waterhole and mineral lick. 8:05 A.M.: A good sized (but not huge) impala ram came in and drank. As I had already shot one big impala, I passed on this one. 11:20 A.M.: Three nice impala rams came in and drank. 12:00 Noon: Twelve kudu cows and yearling bulls came in and licked at the mineral lick and fed on the feed. They were entertaining to watch as they chased each other away from the lick. Then I glanced up and saw a nice waterbuck bull drinking at the waterhole. Had I not already shot a waterbuck, I would have tried to take this one. 1:26 P.M.: A huge bodied (actually pot bellied), nice tusked warthog came in and drank at the same location as the waterbuck. A smaller warthog sow was behind the big one so I had to wait until she cleared. Then I shot the warthog low behind the shoulder and the arrow passed completely through and ricocheted off the ground behind him. I radioed Christo. Before Christo arrived, I looked up and saw four giraffe approaching the waterhole. These were the first giraffe I had seen up close and was enthralled watching them. There were too adult females and two yearlings. One of the adults came up to the waterhole and tried to drink. But because she was so tall, she had to splay out her legs to be able to reach the water. I got some excellent video footage. Then I heard the vehicle approaching and the giraffe galloped off. My warthog had only gone about 150 yards but left surprisingly little blood. I was a little stir crazy from sitting in the enclosed blinds so I decided to sit an open treestand. I had brought my Summit Trophy Chair from the U.S. and was comfortable sitting all day. The treestand was located in the thick trees overlooking an area where the outfitter had been placing some of the feed for the animals. The area was littered with tracks including zebra, baboon, kudu, gemsbok, waterbuck, and eland. My friend Ken Asbury had shot a nice kudu bull from this treestand the previous year. 12:00 Noon: The morning had been pretty slow and I had only seen a few small waterbuck that had winded me. Then I heard an animal approaching from the opposite side of the feeding area. I looked up to see a lone gemsbok coming in. And although I find gemsbok one of the most beautiful, wary, and interesting animals in Africa, I hadn’t planned on shooting one this year because I had shot a nice bull in Namibia the previous year. That was until I looked through my Swarovski 8X30 binoculars and saw that it was a huge bull! His horns were literally about 40 inches long and very massive. It was the biggest gemsbok bull I had ever seen. Boy did I get nervous then! He came into the feed area and started feeding slightly front quartering. But front quartering is definitely not a shot you want to take on these big, tough animals. Their vitals also lie further forward than our North America animals. The bull was very wary and kept looking up and staring at me in my treestand. He fed for a couple of minutes always keeping an eye on me. Then he must have caught a little of my scent and spooked without offering a shot. Boy was I frustrated at not being able to take this bull! 12:45 P.M.: Three small waterbuck bulls came in and fed. A little later, a nice approximate 27-inch waterbuck followed two other cows into the feeding area. 5:00 P.M.: About half a dozen bull and cow waterbuck milled about. 6:00 P.M.: Just before dark, the waterbuck looked up and stared in the direction where the gemsbok had previously come in. Then I heard that clicking noise again and knew that a herd of eland was coming. First a big cow came in and fed. Then a huge bull followed and fed front quartering to me behind the cow. Then several more cows came in and fed. To say I wasn’t nervous at this point would be a lie. But I tried to contain my excitement and make the shot if I was offered it. After feeding for a while, the herd looked up and stared to my right. Then they spooked. I guess I’ll never know what animal was imposing enough to spook a herd of full-grown eland. And while I had a fun and exciting day, it was frustrating not being able to take the huge gemsbok bull or eland bull. But I guess that’s bowhunting. I sat the “Market Place” blind on the Frost Ranch which is a new ground blind overlooking a small manmade waterhole. Activity during the day was very slow. It’s always interesting when you have days like this in Africa. Some days are like watching the Discovery Channel and other days you don’t see much. And most the time there is no explanation for it. But I guess if there weren’t some slow days, it wouldn’t be hunting. 3:20 P.M.: So far I’ve only seen two warthogs and half a dozen impala rams. But the good news is I have read about 100 pages in my book. 4:45 P.M.: Three kudu bulls just appeared in front of the blind. I pride myself on usually being able to hear the animals coming and can usually identify them based on the sound of their gait. But with these bulls, I didn’t hear a thing. They were just there 15 to 20 yards away. There were two mature bulls and one young bull. The two mature bulls both had nice horns. One was wider but didn’t have very deep curls. 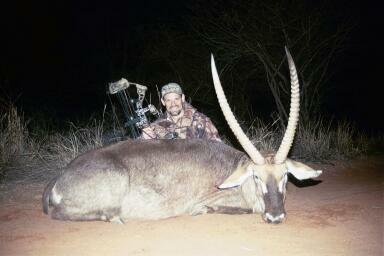 The other bull was narrower but had much deeper curls, which is generally what you look for in a kudu bull. So I elected to take the latter bull if he offered me a good shot. But whenever the bull I wanted stopped to drink or feed, it was always a bad angle or there was another bull behind him. Finally, the bull I wanted starting feeding at the feed on the left side of the blind. To shoot this side of the blind, I had to lean forward from my chair to clear the shooting window. I used my 20-yard pin and released the arrow. My shot was a little forward but the arrow still passed behind both shoulders. I radioed Brian, another PH, and he arrived to the blind about dark. We tracked the bull for about 150 yards and then decided to come back in the morning to continue the track. Any hunter who has shot an animal in the evening and had to wait until the following morning to track it, knows how poorly I slept that night. I was not only worried about recovering the magnificent animal but also about any of the scavengers like jackals and hyenas discovering and dining on the kudu. Brian, John (a black tracker), and I hit the track early. I just generally followed behind the PH and tracker wondering what they were looking at. The blood was good for the first 150 yards but then ran out. Brian and John split up and started searching various possible routes the bull could have taken. But there were tracks everywhere in the sand and I couldn’t understand how they could differentiate the bull from all the other tracks. But John, who is an unbelievable tracker, was pretty sure he was on the bull’s tracks. But then we ran into a herd of kudu cows and calves, which spooked in all directions, complicating matters. But John somehow followed the bull through all these tracks. About 200 yards further, he found the bull. The arrow did pass behind both shoulders but was about 3 inches too far forward and must not have punctured both lungs. I was relieved to recover him though. For the evening, I sat a different treestand overlooking a mineral lick and feeding area. A weather front was moving through and the wind blowing very hard. I didn’t see much – 4 warthogs, 3 impalas, and 2 kudu cows. I sat the Hartebeest Blind on the Frost ranch again. Several small warthogs came in and fed in the morning. 12:15 P.M.: A real nice impala ram with a smaller ram came in, drank and licked at the mineral lick. I wasn’t planning on shooting the bigger ram but he just stood there broadside at 10 yards for about 10 minutes. Finally I couldn’t take it anymore and let him have it. He only went 80 yards and he had 24-inch horns. Impala are inexpensive to shoot and make wonderful trophies. 3:00 P.M.: Several warthog showed up including a pretty nice boar. I probably would have shot him if I hadn’t already taken a warthog. 4:15 P.M.: It’s a good thing I didn’t shoot the warthog because a herd of eland came in. Had I shot the warthog, it would have disturbed the waterhole and the eland probably wouldn’t have come in. The eland drank and then licked at the mineral lick directly in front of the blind. There were 5 cows and 2 young bulls. But unfortunately, there weren’t any mature bulls, which was what I was after. And while I was watching this herd of eland, I glanced to my right and saw a diminutive duiker ram approach the waterhole. What a shock to the senses, seeing the huge eland and the small duiker in the same picture. Since I had not taken a duiker before, I flipped on the camcorder and grabbed my bow. The ram was at 20 yards drinking. Duikers are notorious for “jumping the string” but the shot was well placed and he wasn’t able to dodge the arrow. I hunted the “Baboon Blind” at Pete’s ranch. There is a windmill and a big large, aboveground water tank that leaks and puddles up in three locations. The blind is a pit blind overlooking the three puddles and a mineral block. Several (12-15) kudu cows and a couple waterbuck cows came in and drank and fed in front of the blind. Then a huge warthog boar drank at the water puddle to the left of the blind. He was quartering to me slightly when he was drinking so I waited. When he got done drinking he walked up a bank and stood broadside. A quick shot with my rangefinder showed 24 yards. I released. The boar reacted to the sound and tried to jump the string. But he was only able to drop a couple of inches before the arrow reached him. So the hit was a little high but upon reviewing the shot in my camcorder, looked good. I radioed Christo and waited for him to arrive. It only took Christo about 30 minutes to arrive at the blind but vultures had already found my warthog. Fortunately, they hadn’t chewed on him yet. Apparently the vultures can ruin a trophy faster than you can blink. They eat the lips, ears, and eyes first. The warthog had 12-inch tusks. Since I had disturbed this waterhole, I elected to be moved to a new waterhole for the evening hunt. I really wanted to take a zebra and asked Christo which waterhole he thought would give me the best chance at one. 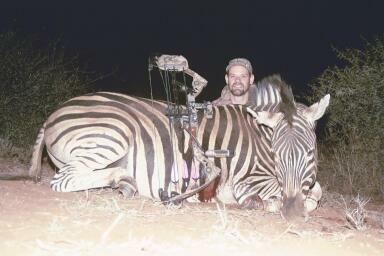 To me, zebra are the most difficult animal in Africa to shoot with a bow. They are extremely wary and generally only come to water at night. In my 3 years of bowhunting the Dark Continent, I had never seen one at my waterhole. Christo thought I would have my best opportunity sitting the “Kudu Pond” blind. So he moved me to this blind and I sat it until dark. 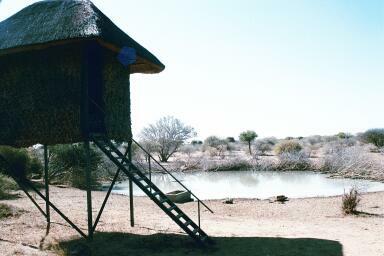 The blind was another elevated box blind overlooking the left side of a natural waterhole. Thorn brush had been placed around three sides of the waterhole so animals had to drink directly in front of the blind offering a nice, close broadside shot. 2:36 P.M.: So far I have seen 4 warthogs and 7-8 waterbuck including a nice bull that wouldn’t come all the way in. But it didn’t matter, I was after striped wildlife. 5:14 P.M.: Well the move paid off! Two zebra stallions came in and drank and only one left. I can’t believe I finally shot a zebra! The hit was good and he only made it 60-70 yards from the waterhole. What a thrill! I’ll never forget peaking out of the small viewing window as they were coming in and seeing stripes. I thought I was dreaming. One animal that I had never taken or even seen before was a blesbok. These prairie animals intrigued me and I decided to spend my last few days trying to put a final exclamation mark on my hunt by harvesting one. One of the problems would be that these animals do not regularly come to water. I sat a blind on Pete’s ranch that overlooks a large, dry lakebed or pan. There is a small waterhole at the east end of the pan. Blesbok, being prairie animals, enjoy hanging out in the open pan. The blind was an enclosed, elevated box blind. 9:00 A.M.: Half a dozen impala ewes and rams came in and drank. Two of the rams were decent. About 80-90 guinea fowl came to water and milled about in front of the blind. I was tempted to shoot one but didn’t want to disturb the waterhole. 10:00 A.M.: I was sitting down in the chair where it was difficult to see out of the blind and glanced up when four blesbok just appeared directly in front of the blind (15 yards away) near the mineral lick. As fast as I dare, I turned on the video camera and picked up my bow. But before I could get a shot, they just walked away without drinking or offering a shot. 11:30 A.M.: A huge, approximate 13-inch warthog, came in and drank at the edge of the brush on the waterhole about 30 yards from the blind. As much as I wanted to shoot him, I decided not to ruin my chances at a blesbok. 6:00 P.M.: Twelve kudu bulls strolled into the west side of the open pan at dusk. Half of them were mature, long-horned bulls. It was a thrill watching them spar with each other. They were extremely wary and did not come in to drink. They were still standing of the far side of the pan when my PH arrived in the vehicle at dark. Today is my last hunting day and I decided to try some “walking and stalking.” So at dawn, Christo and I parked the vehicle about ¼-mile west of the open pan and stalked towards it. When we got to the open pan, we couldn’t believe our eyes. The blind I had sat the previous day was literally surrounded by blesbok. Aargh!! The open pan was also loaded with red hartebeest, impala, and kudu. We tried to stalk around the edge of the open pan to no avail. By midmorning, as the temperature rose and the animals were likely getting out of the heat, Christo thought it would be best for me to sit at a waterhole. So he placed me in the “Baboon Blind” again where a big, lone blesbok ram had been seen several times before. As we drove up to the waterhole, we saw the ram standing about 150 yards from the waterhole in a large meadow. So I climbed into the pit blind and got comfortable. It being my last hunt day, I decided to pay particular attention to the waterhole in case the blesbok decided to water. And I was standing behind the shooting window watching a waterbuck cow lick at the mineral lick when I crouched down and couldn’t believe my eyes. The blesbok ram had somehow snuck in and was watering at the seep about 23 yards to the left of the blind. I grabbed my bow and drew it as quickly as possible. But before I could get a shot, the ram just walked away. I tried to grunt with my voice to stop him but just ended up spooking him. I couldn’t believe it. I had two opportunities at blesbok watering in 2 days and never got a shot. Boy did I take some ribbing from Christo later. Well my hunt was over and I couldn’t believe the blesbok had outsmarted me. Some animals grow on you during the hunt and these animals had definitely grown on me. To be honest, I had gotten a little obsessed about shooting one. But I would have to wait until next year. Or would I? I recalled that my plane flight out the following day was not until late evening. So when we got back to the lodge, I dug out my plane ticket to check the time. The flight didn’t leave until 8:10 P.M. and it was only a 4-1/2 drive to the airport. So it appeared I would have time to hunt a few hours in the morning. But I wasn’t scheduled to hunt that day and didn’t know if the outfitter would allow it. But I asked him and he said I could hunt until 10:30 A.M. and then we would need to leave. Boy was I jazzed! I would have one last chance. I sat the blind on the big open pan again. Of course, even though the blind was surrounded by blesbok the previous day, none came in. I checked my watch and it was 10:15 A.M., only 15 minutes of hunting left. It looked like I was going to go home without a blesbok after all. Then I saw three blesbok rams walk into the open pan. But they would still need to come to water for me to get a shot. I waited and the time ticked away. At literally 10:29 A.M., as I was listening to the vehicle approaching, the lead blesbok began approaching the waterhole. I tried to quietly call Christo on the radio but he couldn’t hear my whisper. And just before the vehicle drove into the pan, the lead blesbok bent down to drink. It was now or never. I released the arrow and the shot looked good. Then I quickly called Christo on the radio and told him to wait a few minutes. The blesbok had only traveled about 90 yards. Christo then nicknamed me “Last Minute Matt.” What a perfect finish to a wonderful hunt! Dave has some of the best prices available. His daily rates are $180/day in South Africa and $200/day in Namibia plus trophy fees. In Africa, you pay a daily rate and then pay trophy fees for the animals you shoot. Dave’s trophy fees are also very low but the trophy quality excellent. Examples of some of the trophy fees are $200 for warthog and impala, $650 for zebra, $700 for gemsbok, $800 for kudu, and $1,100 for waterbuck and eland. Free airport pickup and transportation is also included and most outfitters charge a fair amount of money for this service. If you have any questions about these hunts or would like to experience a hunt like this yourself, please don’t hesitate to contact me at stickandstringoutfitters@att.net or (303) 972-4295. 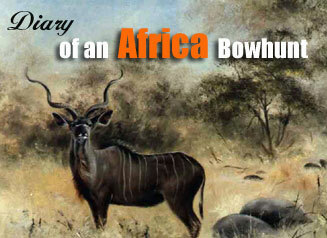 Details and prices of the Africa hunts are also on our website at www.bowhuntingoutfitters.com. Please watch for Stick & String Outfitters latest bowhunting video titled “Africa With Stick & String” which will be out soon. The video will include footage from Dave’s and my hunts in Africa the previous three seasons and will include more than a dozen bow kills.